This is the second in a series of three articles about struggling with past tense -ed and instructional techniques to help. We are continuing the discussion from the article published two weeks ago, Struggling with the past tense: Verbal acquisition of -ed forms of verbs. In this second part of the three-part series, we are addressing verbal fluency of past tense –ed following the combined vowel sounds of diphthongs. Use of –ed after vowels requires a separate more lengthy discussion because there are many vowel sounds in the English Language. The important thing to teach students to remember is that diphthongs are vowel sounds in one syllable. If students can remember that diphthongs at the end of verbs are vowel sounds, then they can easily remember to add the –ed. Have you had students use a mirror to help with pronunciation? Once students learn to listen for and recognize all vowel sounds at the end of verbs, then –ed is simple to add. The –ed is simple to add because it is pronounced with the [d] sound, just like the –ed is pronounced following voiced consonants (as discussed in part 1 of this series). Remember when –ed follows a word that ends in a voiced sound such as “bang,” the word is spelled “banged” and pronounced “bangd.” The same [d] pronunciation follows words that end in any vowel sound. Make sure students remember that when determining which –ed sound to use for the past tense form of verbs, that they listen for the sound at the end of the verb rather than focusing on the letters used in the spelling of the word. This has to be reinforced often through review and practice. Students often forget this rule and want to look at the letters that end the verb rather than focusing on listening to the sounds themselves. Students can’t focus on listening for the sounds without having a good knowledge of how the sounds are produced. The simplest thing for teaching –ed pronunciation after vowels to students, is to teach that regardless of how the vowel sounds are combined or sound, the –ed sound will always be [d]. This is the case even when the verb ending is a combination of vowel sounds such as in a diphthong. For example, the diphthong of the “y” in “try” is pronounced as a one syllable vowel “ie”. When adding –ed to the word “try,” the word is spelled “tried.” But, the word is pronounced “trieed” with the double “ee” as a long “e” sound. Instructional note: Diphthongs happen when two vowel sounds are made within the same syllable. 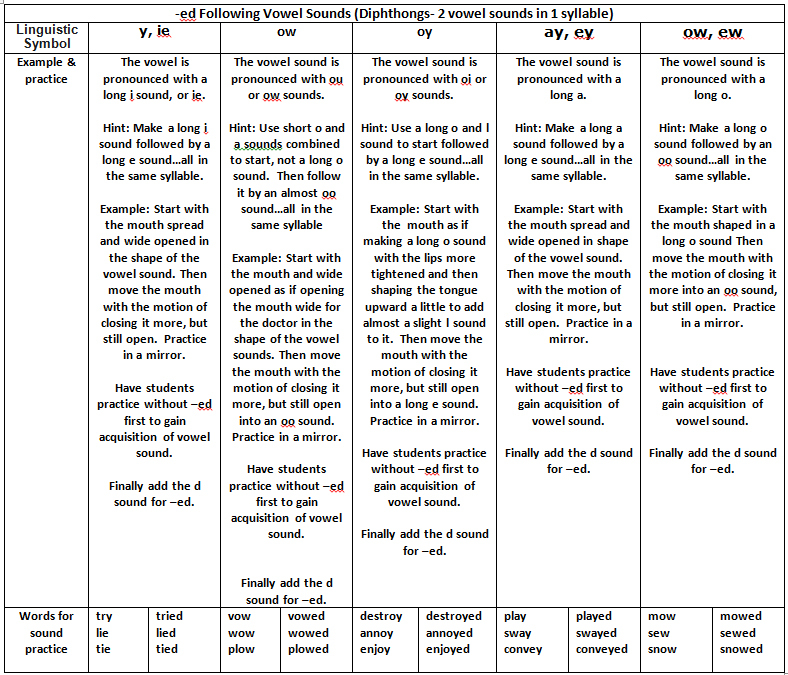 Have students practice the diphthongs with the instructional examples listed in the chart below. Model the sounds closely and often. It is good to show students the pronunciations during whole group explicit instruction. Provide mirrors for student pair and individual use. If you can’t provide mirrors you can also have students record each other using a video recorder. After this, break students up into pairs to practice. Roam around the classroom and again demonstrate how to pronounce the diphthongs to each pair. After demonstrating, have students produce the sounds back to you so that you can listen to their sounds and observe their mouth shape. Have them practice in the mirror again. Next, have student pairs make a chart of verbs that end in diphthongs. After this, have them work together to practice saying the verbs they have charted. Have partners listen to each others’ pronunciations, and watch the mouth shapes of their partners as they produce the sounds. Partners can also audio or video record the sounds for additional support and reinforcement. Transition to having pairs script conversations with verbs ending in diphthongs followed by –ed. Finally, have students practice unscripted real conversations using the past tense forms of verbs ending in diphthongs. Diphthongs are sometimes hard to produce. Instructors should be very patient and include regular practice of these vowel sounds. Once students have fluency of the combined vowel sounds in one syllable, it is much easier to add the [d] sound for the past tense –ed ending. Through ongoing practice, students will become more comfortable and will be able to produce sounds without thinking. And, if they do make a mistake they will be at the point of self-correcting on their path to fluency. At this point, they have reached the ultimate instructional goal! Beth Crumpler is an ESL Instructor for ELS (English Language Services), a freelance curriculum writer and an e-learning course developer in various areas of TESOL. Beth has written content for CTY-Online Johns Hopkins University and Pearson. She is a certified teacher of ESL and music. Beth enjoys studying technology for teaching ESL, and in her spare time studies Spanish.